When applying these code-words to the Bible, not only can one identify the lost tribes of Israel, but one can understand that today’s world events are encoded for them as well. God scattered the tribes, but He knows exactly where they are. God hid their identities as punishment for turning their backs to Him. Then, Satan, who also knows who they are, created a single counterfeit replacement tribe from the Tribe of Esau – Jacob’s older brother, who sold his birthright to Jacob for a bowl of soup. The Bible prophesied that in the End Times the Lost Tribes of Israel would discover their identities. 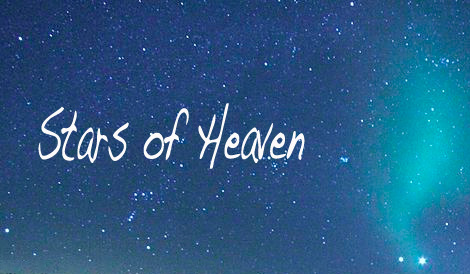 The “stars of heaven” is the Biblical code-phrase for the fallen angels. With time, it refers to the descendants of Abraham through his two sons Ishmael and Isaac. Next, it describes the descendants of Isaac through his son Jacob, who was renamed Israel. And while its interpretation can continue to be narrowed down, references to fallen angels or all of Abraham’s seed should not be ignored or discarded, because meanings are always layered; and things always come around again. But, in continuation, it would go on to refer to America the Great, with its star-spangled banner. The fallen angels, or stars of heaven, were light-beings. Individually they were like small beams of light, just like stars appear as small beams of light – thus the use of the symbolism as stars. As seeds of Abraham, they were the adopted children of God. As Israelites, they were God’s shining stars. As Anglo-Americans, they were one of God’s Two Witnesses. From the House of Israel, the Sun rose. More specifically, this means the British Throne. The British Throne is the Throne of David, which God told David would “be ‘as the Sun’ before Me (God) forever.” It’s ancestry dates back to king David, which at one time the British monarchy took great pride in – being descendants of David, of the House of Judah from the original 12 Tribes. Do not confuse the House of Judah with the House of Esau, because currently the House of Esau has possession of the Holy Land of Israel, and falsely call themselves both Judah and Israel. British is the Hebrew word meaning People of The Covenant – and the people of The Covenant are the true People Israel. It’s a people, not a country. The British are Israelites; and they were God’s Witnesses. The Moon represents the Old British Commonwealth; and they are Israelites too. This moon became a reflection of the British Sun, or Throne of David. While the British witnessed for God, they translated His Word into every language and carried it around the world, drawing more and more people into the kingdom and the light of Christ. Mahatma Gandhi stated that, if the British had ever been truly Christian, there would be no other religion on Earth. 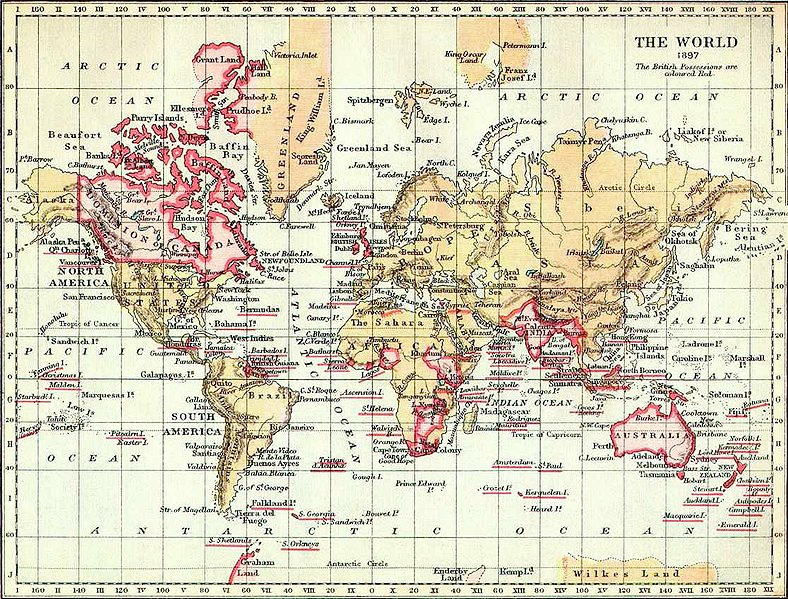 At its height, the British Empire was the largest the world has ever known – an empire that spanned the globe, so that the Sun never set on it. 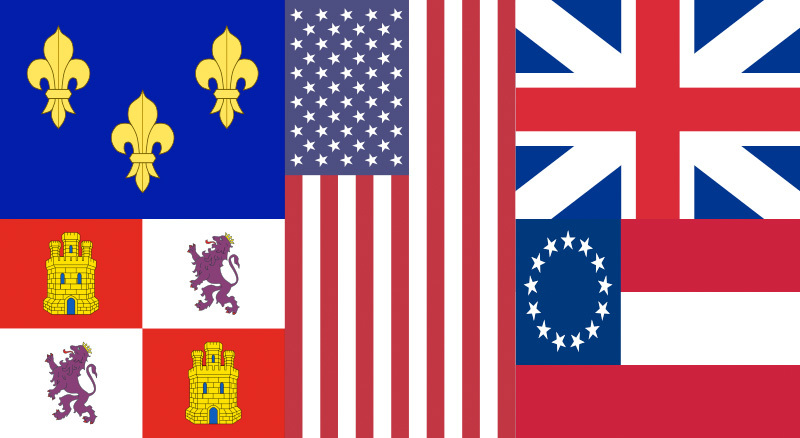 The Old Commonwealth proudly placed the British flag, the People of The Covenant’s flag, on its banners, like Australia, South Africa, and New Zealand, for example. Israel was born through the line of Abraham’s son Isaac. God promised that Abraham’s miracle son would become a Great Nation, a multitude of nations and would spread to all corners of the Earth. God renamed Jacob to Israel, because the word means Champion of God. Because Israel means Champion of God, one can become an Israelite by adoption, as did Mohammed, from the Tribe of Ishmael. Mohammad DID champion for God, and thus, by definition, became an Israelite, because God keeps His promises; and He made promises to the Tribe of Ishmael. God’s adopted children should have united, but they didn’t. Out of free-will choice, they listened to Lucifer/Iblis again; and not only did Ishmael and Isaac divide; they allowed Lucifer to continue to divide them further from within with religious sects – like with Sunni and Shiite, and Catholic and Protestant. Divide and conquer. Now, Satan’s Synagogue has pitted them against one another in wars and conflict – BECAUSE he plans to kill ALL of the seeds of Abraham. 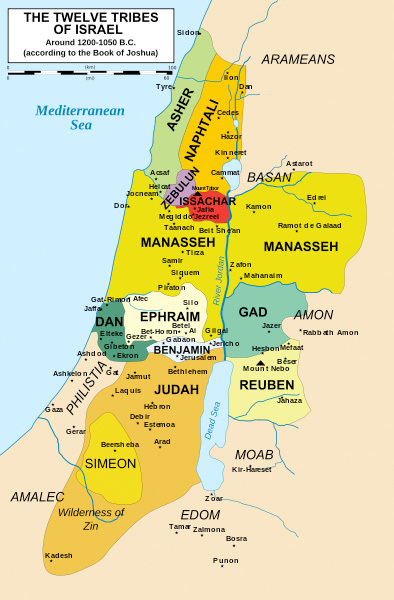 Satan’s adopted children, known as his Synagogue, from the Tribe of Esau, and its AshkeNazi and other converts, hijacked the name Israel, when it took possession of the Holy Land from its rightful owners the British, and renamed it the “State of Israel”; but the Holy Land of Israel encompasses all of Canaan. Esau’s goal was to steal Jerusalem, God’s City of Peace and to keep God’s adopted children away from Mount Moriah, and symbolically away from Him. God cherished Mount Moriah, because it is where Abraham offered Isaac and passed his soul’s test of obedience. Abraham became a shining star. Mohammed preached that Muslims should pray facing Mount Moriah in Jerusalem; but after he died, they turned back to Mecca, choosing again to listen to lies. Jerusalem is in the hands of a DEN of thieves, robbers or dragons – same thing, in code. Dens are dark; and things lurk within them. When the House of Judah was carted off to slavery in Babylon, Esau moved in to set up house. Their leaders were the husbandmen who killed Jesus’ body, or the cross He bore for Israel, the human body. And in this generation, they’ve managed to take the Holy Land again, because history repeats itself. Those who do not learn the lessons from history are doomed to repeat them. If one wants to know what is happening today, apply the code words to the Bible – it’s full of current-affairs. They were encoded, to protect the prophecies for the last generation, living in the End of these Times – Winter, with its coldness and death. A perpetual Summer and life are coming – once the Crown is given to its rightful owner. This is presented in the movie Legend, when the male unicorn’s horn is restored. The male represents Christ Prince Michael and the female represents Israel. Unicorn (Unique Horn) means One Horn, or His Kingdom – the one kingdom world without end. Thus, horn means kingdom and can be interpreted as that Biblically. This is why Lucifer inspired other “illuminated” doctrines, like the Talmud, the Hadith with its Sharia-law, Catholic Babble-Ons, and New-Age dogma. God gave man The Torah, the Holy Bible and the Holy Koran. Wisdom is found in these. In the others, wickedness and lies are found. Once stars were Beings of light, but we fell from grace; and were cast out of Heaven. This is explained in several places in Scripture, like in the Book of Enoch/Idris, which was given to Noah by Archangel Prince Michael after The Flood. Noah’s great-granddad Enoch was TAKEN, or beamed-up, to be given Knowledge, so that he could RECORD it for the world. In his close encounter, he was told about us stars and this planet, from the beginning to the end. “Then the angel said: This place, until the consummation of heaven and Earth will be the PRISON for the stars, and the host of heaven (see Rev. 12:9-7). The stars that roll over fire are those who transgressed the Commandment of God before their time arrived; for they came not in their proper season. Therefore was He offended with them, and BOUND them, until the period of the consummation of their crimes in the SECRET YEAR (see Matt. 24:36; Sura 7:187) (Enoch 18:15-16).” The fallen angels were bound in cellular bodies on prison planet Earth, a reform school, for an appointed time, an appointed day – it’s THAT DAY written about in God’s Holy Books. Jesus said, “Ye are of [YOUR] father the devil, and the lusts of your father ye will do. He was a murderer from the beginning, and abode not in the Truth, because there is no Truth in him. When he speaketh a lie, he speaketh of his own: for he is a liar, and the father (inventor) of it. (John 8:35).” He was speaking of Lucifer/Iblis, the leader of the fallen angels. On Earth, the fallen angels would have a chance to prove their true allegiance to Lucifer, and his leaders, OR to God and His Archangel Prince Michael/Christ. And we were warned, “Be not associates with them (devils-liars); but keep yourselves at a distance from their oppression; you be associated with The Host of Heaven. You, ye sinners, say: All our transgressions shall not be taken account of, and be recorded. But all your transgressions shall be recorded DAILY (Enoch 104:5).” Jesus called us prisoners, “Verily, verily, I say unto you, Whosoever committeth sin is the prisoner of sin. And the prisoner abideth not in the prison-house for ever (only until The Reaping): [but] the Son Liveth for ever. (John 8:25-26).” He refers to our original sin – the insurrection in Heaven. God did stay near to them in His Tabernacle, “And the “I AM” appeared in the Tabernacle in a pillar of a ‘Cloud’: and the pillar of the ‘Cloud’ stood over the door of the Tabernacle (Deut. 31:15)”. He watched over them and fed them in the wilderness for 40 years. Solomon’s Temple was built to replace the Tabernacle, so that God would have a fixed place on Earth for the high priests to communicate with Him via The Ark of The Covenant. God is brilliant, and much care had to be taken in its construction. But Israelites started chasing after strangers, conducting themselves in abominable ways. God became furious. These abominations were shown to Daniel in his close-encounter, as God took him to show him these things. The Cloud above the pillar of fire would later be called the Star of Bethlehem as it watched over Archangel Prince Michael/Christ when He came as Jesus. It’s what beamed Him up when He ascended from the Earth. When it returns, it will be called New Jerusalem, His Starship Enterprise, if you will. After the thieves crucified Jesus instead of giving Him the crown, God destroyed the Temple for the second time, in His fury. The Temple Veil being torn represented the fact that Christ came to be the High Priest; and once He completed his mission, no other priests would be needed to talk to God. After He was taken, Christ sent the Holy Spirit to the inhabitants, the stars, of the Earth. It became their individual direct link to God; and everyone can use it to communicate with Him without a priest or intermediary. It’s a free-will choice. Jesus came to reinstate God’s Law from the First Covenant. He also became the Covenant of Peace. Souls have to believe Him – believe what He taught, then LIVE by The Law. He told His disciples to go to His lost sheep – scattered Israel, the lost tribes, from the descendants of Israel’s sons Rueben, Simeon, Levi, Judah, Zebulun, Issachar, Dan, Gad, Asher, Naphtali, Joseph, and Benjamin. They were scattered all over the globe, and sifted through all the nations of the Earth. God’s Two Witnesses came from Jacob-Israel. Identifying which group of stars they are is simple. Israel gave his name to his grandsons, Manasseh and Ephraim, who were Joseph’s sons. “And Israel stretched out his right hand, and laid [it] upon Ephraim’s head, who [was] the younger, and his left hand upon Manasseh’s head, guiding his hands wittingly; for Manasseh [was] the firstborn. . . his younger brother shall be greater than he, and his seed shall become a multitude (Commonwealth) of nations. . . And he blessed them that day, saying, In thee [Joseph] shall Israel bless, saying, God make thee as Ephraim and as Manasseh: and he set Ephraim before Manasseh. And he blessed Joseph (of the Coat of many Colours), and said, God, before Whom my fathers Abraham and Isaac did walk, the God which fed me all my life long unto this day, The Angel which redeemed me from all evil, bless the lads; and let my name [Israel] be named on them (let Ephraim and Manasseh be called Israel), and the name of my fathers Abraham and Isaac; and let them grow into a multitude in the midst of the earth. (Gen. 48:14-16).” Remember, God said unto Abraham in Isaac shall thy seed be called – Saxons (Gen. 21:12). They did grow into a multitude. 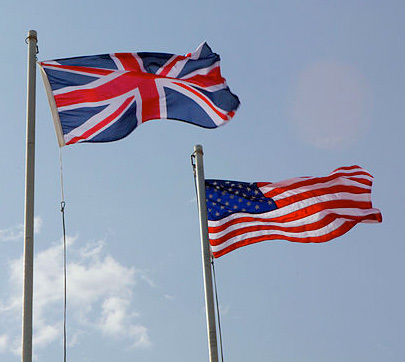 Ephraim (the Engelish) became Great Britain and Manasseh became America the Great. Although Ephraim was younger, he became greater, because he received the Birthright of Jacob-Israel from Jacob’s right hand, and he had the Throne of David and founded the Commonwealth – the sun and moon. Both the English and Americans were blessed, being given abundant, fertile lands and success in conquering the world, but they, like their ancestors, also turned their backs to God. They started creating all kinds of other legislation, accepting multiculturalism, and the removing of God and Christ as the heads of their nations. They stopped testifying in Jesus’ name, stopped prophesying for the “I AM”, and went in the ways of Babylon and strangers to God and His Ways. 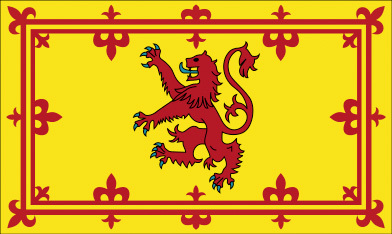 The House of Esau is represented as the fig tree, whereas the real House of Judah’s symbol is a lion, as represented on the Israelite-Scottish banner for example. “And there came from the sky many stars that did fall towards the earth and the time was seen, for late were the ‘figs’ that dropped from the tree. And all stood in fear, for great was the wrath of the Lamb. And his servants threw out all the priests of the Earth who all had given false prophecy, for they had laid bare ‘the earth’ and caused the ‘stars of heaven’ to move (Rev. 24:17-18).” The figs, the thieves, will be too late. All their plans, of an UN-style one-world nomocracy ruled by Satan and his sons, will be TOO LATE – they called forth only Judgement instead. This means judgement for all the fallen stars, or fallen angels. The world is being divided into two camps, two troops. Here’s the spoiler: the red division loses. Earth is another codeword; “And the “I AM” God formed man [of] the dust of the ground, and breathed into his nostrils the breath of life; and man became alive and was given a soul [spirit Being] (human+being) (Gen. 2:7).” This describes the fallen angels submitting to Adam and Eve’s human-limitations; and entering their human cells on Earth. After they listened to Lucifer again in the Garden of Eden, they were cursed to live out many human lifetimes, coming from dust and returning to it, in regenerations. They chose this route instead of just learning from God in the Garden. His Spirit was THERE walking WITH them. When they believed Lucifer and saw themselves as humans, instead of spirits, they fell from Grace again and were naked. Lucifer became Satan because the word means Opposer. Devil means Liar. And Lucifer/Iblis has made sure there are lots of little devils in the world. In these human lifetimes, the fallen angels would spend time on Earth as the dust of the earth, hopefully learning not to listen to liars. God refers to the stars of heaven becoming dust with Abraham, “And I will make thy seed as “the dust of the earth“: so that if a man can number the dust of the earth, [then] shall thy seed also be numbered (Gen. 13:16).” Earth is also the code-word for the down-trodden, oppressed people, like the earth is walked-upon and trodden down and compressed underfoot, and, unlike the Sea, does not move about restlessly. 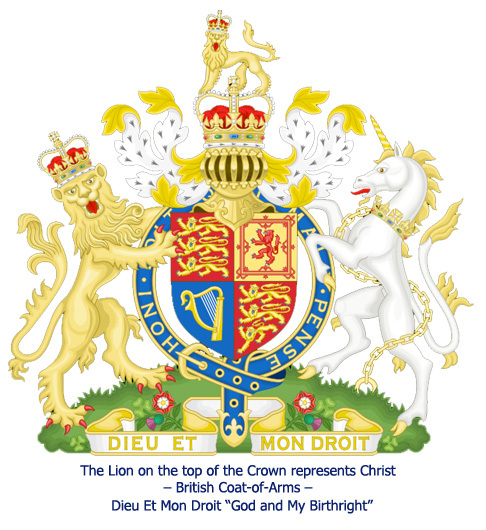 Why did THEY remove the Top Lion on the Coat of Arms? When the Sun is used in the Bible, it can mean Christ, the Sun of Righteousness; who is the Light of the world; or it could mean His Throne, the Throne of David, of which He is its rightful owner. David can be interpreted to mean king David, but it can also mean Christ, as the name means “Well-Beloved” and that’s who Christ is to God, His well-beloved Son (Matt. 3:17). “And I will set up One shepherd over them, and he shall feed them, [even] My “Well-Beloved” servant; he shall feed them, and he shall be their shepherd (Eze. 34:23).” This scripture obviously refers to Christ, not king David, who had been dead for hundreds of years. Christ fed them Truth, not lies. There are many references to the Throne of David being Christ’s Throne. He is the King of Israel, their Shepherd; and they are His lost sheep. He’s also the Messenger for those who can truly see and hear. The House of Israel is oftentimes called the House of Jacob, “And say unto them, Thus saith the Lord “I AM”; In the day when I chose Israel, and lifted up Mine hand unto the seed of the “House of Jacob”, and made myself known unto them in the land of Egypt, when I lifted up Mine hand unto them, saying, I [am] the “I AM” your God; (Eze. 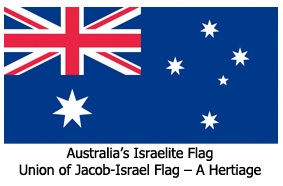 20:5).” Making the connection to Jacob brings us to the British flag – the Union of Jacob’s flag. Its nickname is Jack. 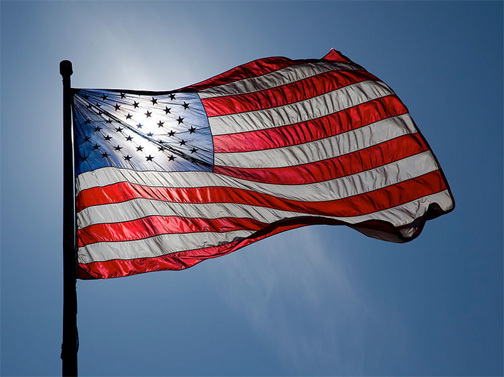 The Sun is represented on the flag as the crosses flare out from the center. But it contains a deeper spiritual meaning. This banner is a Hebrew-Israelite Banner, and is featured on the shield of Queen Teia Tephi, the true Britannia. She was Zedekiah’s surviving heir who eventually made her way from Jerusalem to Ireland, with Jeremiah the Prophet, escaping Jerusalem’s destruction. Teia, being from the House of Judah-Pharez, married the high king of Ireland, from the House of Judah-Zarah whose descendants made their way to Ireland and Scotland years before. This marriage united the two houses of Judah’s twin brothers who fell out with one another long before. 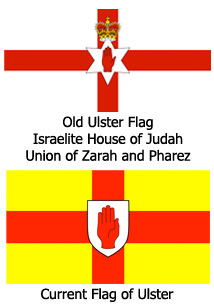 The British Union of Jacob/Jack flag is Christ’s flag, because it is the Union of Jacob-Israel’s flag and unto Shiloh/Christ shall the gathering (union) of the (Jacob/Israel) people be (Gen. 49:10). It features two crosses, also known as the Hebrew letters “aleph” and “tau” and can be translated as “tau a tau”, which means “mark a mark”. It’s symbolic as a mark of God, which gives a deeper meaning to when God said, “set a mark” over His people. One cross is diagonal, because the proper way to “tau a tau” is diagonally. The meaning doesn’t stop there. They are the “First” and the “Last” letters of the Hebrew alphabet. 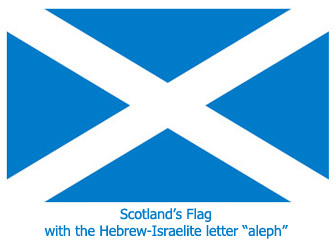 The Hebrew letter “aleph” is a diagonal “tau”. And in Greek the first and last letters are Alpha and Omega. New Testament Scripture tells us that God is the Alpha and Omega, so the crosses on the flag represent Him, and it’s flown by His chosen people. 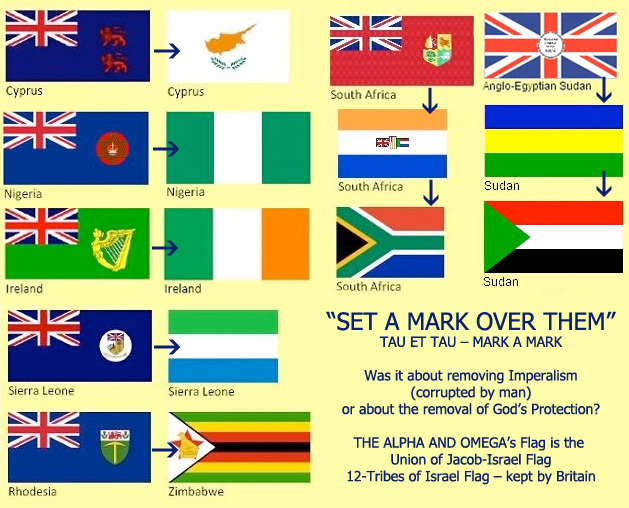 These symbols made their way around the world, through Commonwealth flags like with Australia and South Africa. 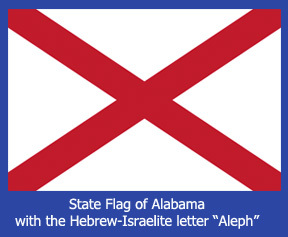 But an Israelite heritage can be seen on other banners around the globe, right down to the state flag of Alabama. 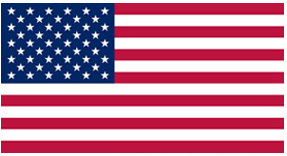 Satan has inspired man to remove, or try to remove, God’s symbol from national banners, like in America, Canada, Ireland and South Africa. This act is to try to remove God’s protection from them. 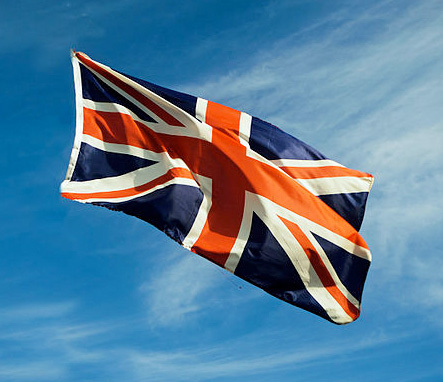 Great Britain did become a vast kingdom on Earth, a United Kingdom. In spreading God’s Word and while protected by Him under His Mark for doing so, they brought God’s light to the world, turning many peoples into God-fearing nations, thus adopting them into the kingdom. Commonwealth nations included countries like Canada, Australia, New Zealand, South Africa and Newfoundland. They included India, Pakistan and former Malaya; still more with Rhodesia, Nigeria and Sierra Leone and others, along with Malta and Gibraltar. The British were able to reach into the corners of the Earth. 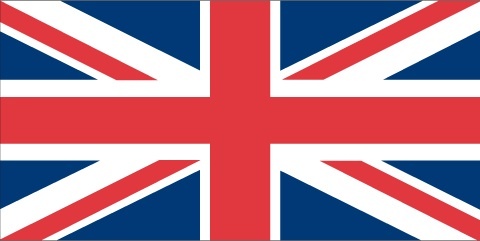 Once the British king’s title held God in esteem, and a king’s title was followed with “by the Grace of God, of Great Britain, Ireland and the British Dominions beyond the Seas, King, Defender of the Faith”. Until Satan put his hooks into the nation and appealed to their human selves with greed and vanity. 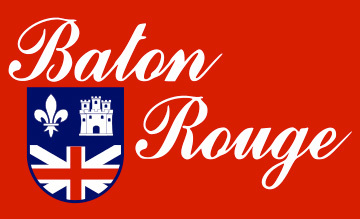 Satan’s managed to hijack the British Commonwealth too. Through congresses, declarations, treaties, charters and articles, he’s managed to transform the Old British Commonwealth into the New Commonwealth, now termed the Commonwealth of Nations in the United Nations. Once these God-fearing countries stood strong, having British Israelite Tribes upholding God’s Law within them. Now, they are like the other Two Witnesses, chasing after strange liars whose god is gold and power. Satan’s got the whole world fooled into believing paperwork is stronger than faith. Paper may be made from God’s creation that little liars have destroyed; and can be even translated into the worship of wood; but it’s not the stronger or a wiser choice. In the game of “Rock, paper, scissors”, paper wraps the rock, like that’s going to work. False illusions. What about when the rain (Truth) comes? It might be worth asking how close is Great Britain to losing its power; or has it already lost it? Does it shine for God? How close is the Commonwealth to turning blood red, which means communist? How many are now assembled in the United Nations? 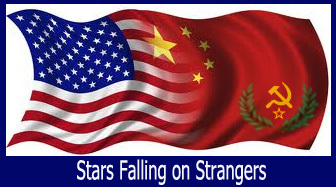 How soon are the stars of heaven, the United States, to falling; or have they already fallen and can’t get up? Or, for that matter, the stars within the Muslim nations; have they also fallen? Some stars will rise again, meaning some fallen angels will become their Beings again and regain their immortality. “And many of them that sleep in ‘the dust of the earth’ shall awake (the Sleeper must awaken – Dune), some to Everlasting Life, and some to shame [and] everlasting contempt. And they that be wise shall shine as the brightness of the firmament; and they that turn many to Righteousness as the stars for ever and ever (Daniel 12:2-3).